Home » PR Tactics » AP Style … or Not? AP Style … or Not? If you’ve checked out the bio for me on the About EndGame PR page, you know that I started my communications career in broadcast news. I worked as a radio anchor and reporter, a TV news producer, and then as a radio news director and morning anchor. One thing you learn very quickly in broadcast news is that you have to write fast, you have to write accurately, and you have to write conversationally. While those first two lessons have been invaluable, the third has been extremely helpful as well, as I’ve transitioned into being a content creator. Most professionals know by now that a regular stream of content for your website and social media properties is important. The problem is that when some business owners sit down to write an article or blog post, they try to emulate the Wall Street Journal. In short … they rely too far on what is called AP Style, even if they don’t know what it is. 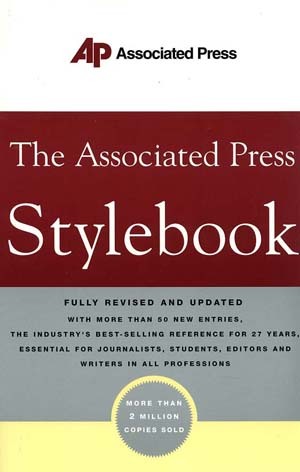 The AP Stylebook, published since 1953, is a journalist’s bible for spelling, language, punctuation, usage and style. The problem is that while it’s enormously useful for all journalists, its tips are geared heavily toward newspaper reporters. While newspaper writing has become much more casual over the last decade, it’s still not really right for today’s web-based content. When writing for blogs and social media, it’s best to put down the words in a way that’s close to how you would speak them. This is very similar to the way broadcast copy should be written. It should be conversational and, at least with blogs and social media, with a little bit of an attitude. What this means is that contractions are okay, some slang is okay, and writing like the Wall Street Journal is out of the question. So, when writing a company blog post, what’s most important? Clearly, misspellings are a no-no, as they make your company look less than intelligent. Proper grammar is also important, but can sometimes be stretched a bit. Avoid too many industry buzzwords and acronyms, unless you know the only people reading your post will be those who understand that language. Finally, above all, loosen up a bit.